CarePlus™ Server is integrated with all CarePlus™ Nurse Call systems for dependable alarm management and care coordination procedures. CarePlus™ Server sends the right message to the allocated caregiver via email, paging or mobile device, at the right time. Global Staff Assignments permits clinicians to receive messages from multiple areas as pertinent only to the assigned caregiver, filtering non-actionable alerts for improved productivity. Life safety messages and alarms are prioritised to organise message handling and communication systems to reduce alarm fatigue. Instantaneous notifications and alerts are transmitted to selected devices to create a calmer care environment to facilitate peaceful patient recovery and to improve staff concentration. 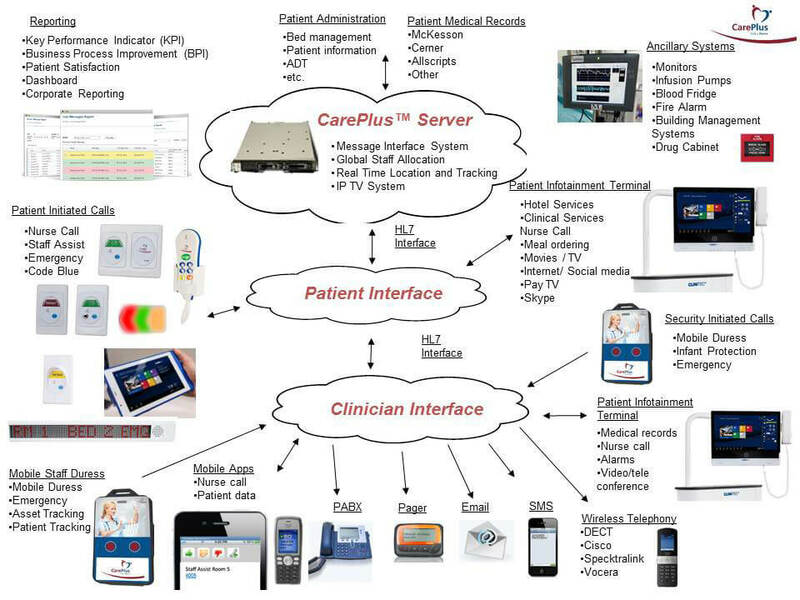 CarePlus™ Server is integrated with various interfaces and patient databases to improve healthcare amenities for superior communication and caregiving.